GB 12 powder is a combination of glycine and vitamin B12. Glycine is an amino acid, one of 20 used to make proteins in the human body. Glycine shows some potential for limiting brain damage caused by ischemic stroke if treatment begins within several hours of a stroke. Methylcobalamin normalizes protein transport in the cells of diabetic patient. It exhibits inhibitory effects on nerve degeneration in people with neuropathies. Methylcobalamin accelerates the metabolic pathways of nucleic acids, proteins and lipids through its involvement in the transmethylation reaction; thus, it exerts a repairing effect on injured nerve tissues. 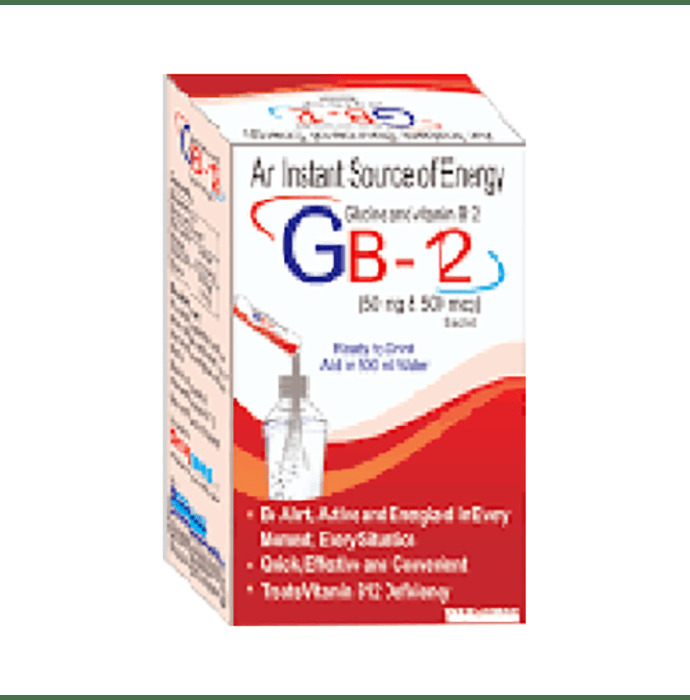 GB 12 helps the person to be alert, active and energized in every moment and every situation. It is quick, effective and convenient and treats vitamin B12 deficiency effectively. GB 12 is useful in treating vitamin B12 deficiency, chronic fatigue syndrome, for healthy blood and mental alertness.